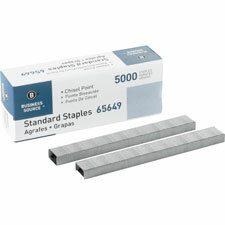 Standard Chisel Point Staples provide efficient and dependable performance in all stapling machines that use standard staples. 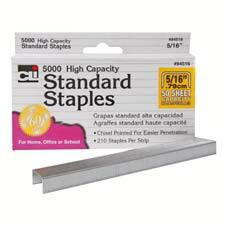 Fit all standard staplers. Crown measures 1/2" wide. The leg length is 1/4". 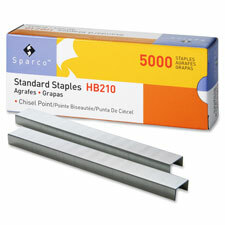 Each staple fastens up to 30 sheets. 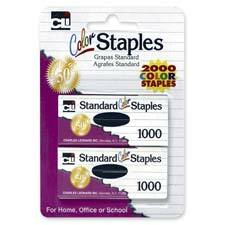 Staples come in strips of 210. 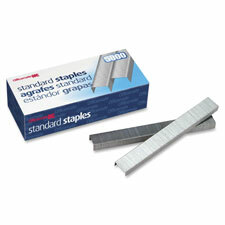 Are you looking for a great place to buy general office supplies? Then you have come to exactly the right place! Office Quarters is a virtual office supply store featuring over 24,000 office supply items, including hard-to-find items at great prices. Expedited shipping is available to the Continental US for an additional cost, however some furniture may not be eligible for expedited shipping. All payments will be accepted in U.S. dollars only and international shipments may require a wire transfer of funds or an International Money Order before your order is processed. We accept Purchase Orders and Corporate Purchasing Cards from Federal and State Agencies, Colleges and Universities. retail customers should use a major credit card via our online shopping cart. We maintain a 30-day return policy to ensure you get exactly what you want. Contact returns@officequarters.com if you need return merchandise labeling instructions. Looking for even better deals? Check out our Specials Page or like us on facebook for access to rock-bottom prices and great store discounts. OfficeQuarters is a registered UpFront Merchant and processes all sensitive data using 128-bit SSL technology for maximum security and protection.